India's economy will likely grow faster next fiscal year than in 2011-12 because of an improved external environment and a shift in policy focus from containing inflation to promoting growth, Chief Economic Adviser Kaushik Basu said Wednesday. The BSE Sensex fell 0.4 percent on Wednesday, snapping a two-day rally, with investors wary ahead of quarterly corporate results that will begin next week amid slowing economic growth and high interest rates. Indian mutual funds’ average assets under management (AUM) fell by 4.4% or Rs 310 billion to Rs 6.82 trillion in the October-December 2011 quarter from Rs 7.13 trillion in the previous quarter. 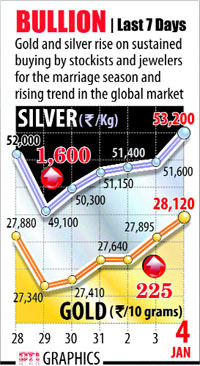 The fall can be attributed to redemption by corporates and banks besides the ongoing slide in the equity markets. An empowered group of ministers (eGoM) is expected to meet next week to decide on more sugar export during the marketing year ending September 2012. India Inc raised over $1.58 billion from overseas markets in November through external commercial borrowings (ECBs) and foreign currency convertible bonds (FCCBs). Companies had raised $2.47 billion in October through ECBs and FCCBs. There were a slew of launches lined up a day before the 11th edition of the Auto Expo gets under way here with Daimler India Commercial Vehicles announcing on Wednesday the launch of its new range of trucks under the BharatBenz brand, Hero Group firm Hero MotoCorp unveiling three new models of motorcycles and Ford India having a global launch of its new compact sports utility vehicle, the EcoSport. In a major cost-cutting exercise, private sector air-carrier Kingfisher Airlines is believed to be considering about 2,000 job cuts and longer working hours for its staff, among various options. Yahoo Inc has named Scott Thompson, president of eBay Inc.'s PayPal division, as its new CEO. The struggling Internet company, which announced its choice Wednesday, has been without a permanent CEO since early September. Amid interministerial differences, the cabinet on Wednesday deferred a decision on the department of disinvestment’s proposal to raise Rs 40,000 crore from divestment of PSUs through buyback and other modes. India's economy will likely grow faster next fiscal year than in 2011-12 because of an improved external environment and a shift in policy focus from containing inflation to promoting growth, Chief Economic Adviser Kaushik Basu said Wednesday. However, he told Reuters in an interview that public finances were expected to remain under pressure in 2012-13. Although the official forecast for FY13 is still to be released, some private economists now expect the annual economic growth to be below 7%, lower than 7-7.5% widely expected for the current fiscal. "I’d forecast next year to be better than the present one," Basu said, predicting close to 7.5% growth in 2011-12, a pickup the following year and a return to the economy's "full-steam" growth of around 9% by 2013-14. In December, the government slashed its growth forecast for the current fiscal year to about 7.5% from 9% amid slowing domestic and global demand. "The US is on a slow rise. Europe is still on the brink, but if you ask me to bet I would say, on balance, it would escape falling into another recession," Basu said. "If these expectations are right, then I think India has enough fundamental strength that we will get out of the current slowdown and begin to move." A combination of policy paralysis in the wake of a slew of corruption scandals, high inflation, high interest rates and an uncertain global environment has hurt Asia's third-largest economy, which had averaged annual economic growth of nearly 10% before the financial crisis of 2008. GDP growth slowed to 6.9% in the quarter to end-September, its weakest pace in more than two years, and industrial output contracted in October for the first time in more than two years. Basu said weak industrial activity could pull down growth in the October-December quarter to below 6.9%, but there would be a recovery in the final three months of 2011-12. "My belief is we have done pretty poorly in the third quarter. In the fourth quarter (January-March), I expect a bounce back, though a moderate one. 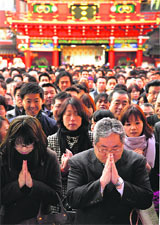 Growth should exceed 7.5%," he said. A slowing economy has hit government's tax revenue receipts, sparking concerns that the federal fiscal deficit could miss the budgeted target of 4.6% of GDP by almost one percentage point in the current fiscal year. "I don't think it’s going to be a very big miss the way some people in the market are speculating. We’re keen to keep it as close as possible to the target," Basu said. A series of rate rises since early 2010 to combat inflation, a weak rupee and sluggish consumer spending are likely to weigh on the results of many companies, while concerns remain about the impact of the euro zone debt crisis on the global economy. Hindustan Unilever Ltd's shares were among the biggest losers and closed 3.1 percent lower at 395.45 rupees, its lowest closing level in nearly three weeks. 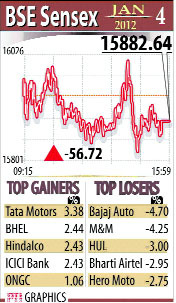 The main 30-share BSE index ended down 0.36% or 56.72 points at 15,882.64, with 18 of its components in the red. "We’ll see a sustained rally in the market only when the key structural issues like inflation and growth are addressed otherwise the pessimism will continue to be there," said Anshu Kapoor, head of private wealth at Edelweiss Wealth Management. "The earnings season is certainly going to be a negative drag on the markets in the near term due to issues like weak currency, higher input costs and the European debt crisis,"
According to an analysis by Crisil of the data released by the Association of Mutual Funds in India (AMFI),as many as 24 of 44 fund houses logged a fall in the average assets under management in the December quarter. Reliance Mutual Fund posted the highest fall in absolute terms by around Rs 84 billion or over 9% to Rs 823 billion. SBI Mutual Fund followed with its average AUM falling by nearly Rs 62 billion or 13% to Rs 416 billion in the latest quarter. In percentage terms, Union KBC Mutual Fund saw the highest fall at around 38% to end with assets of Rs 54 billion. Among gainers, JP Morgan Mutual Fund registered the highest growth in average AUM, which rose by Rs 20 billion or 42% in the quarter to Rs 676 billion. HDFC Mutual Fund retained its top average AUM position across fund houses in the December quarter with respect to total assets managed. Its average AUM was Rs 886 billion, down Rs 32 billion or 3.48% from the September quarter. Reliance Mutual Fund maintained the second slot at Rs 823 billion. ICICI Prudential Mutual Fund was third at Rs 694 billion, its average assets were down Rs 58 billion or 7.78% over the quarter. Average AUM of gold exchange traded funds (ETFs) continued to witness strong growth, rising over 30% over the quarter to Rs 92 billion. Domestic gold prices rose by over 4% in the quarter ended December, and 30% in the past one year, on the back of investments in the safe haven asset. Equity mutual fund assets fell by over 5% in the quarter to Rs 2.07 trillion mainly on account of market-to-market losses as the S&P CNX Nifty fell by over 6% in the quarter on weak global and domestic economic indicators. Investments by banks in mutual funds fell to Rs 493 billion as on December 16, 2011 as compared to Rs 658 billion as on September 23, 2011. According to sources, Finance Minister Pranab Mukherjee-led group may meet sometime next week to take a call on this major demand of the industry to allow additional exports of at least one million tonnes to enable domestic mills to take advantage of lower than anticipated output in top supplier Brazil and reduce the liquidity crunch in the sector. The eGoM had last November approved sugar exports of one million tonnes under the open general licence scheme in the current marketing season. Basing its arguments on availability of surplus stocks, the industry has been clamouring for more, at least 3 mt. The sugar industry will be conducting its second satellite mapping on sugarcane harvesting for the 2011-12 sugar season in the beginning of February to firm up and update the industry’s estimate of 26 million tonnes of sugar production of the 2011-12 season. India, the world’s largest sugar producer after Brazil, allowed exports of 1.5 million tonnes under the open general licence scheme in 2010-11 after a gap of two years when it faced a shortage. Industry experts, however, argue that sugar mills lost out on a chance to maximize export returns by cashing in on soaring global prices in February and March last year due to the late decision. The fall is on account of volatile global conditions, according to experts. Around 75 companies raised around $1.33 billion for various projects through the automatic route in November which does not require approval from the Reserve Bank of India or the government. Another $253 million was raised through the approval route, according to RBI data. Public sector ONGC Mangalore Petrochem raised $250 million through ECBs for its new projects. Similarly, Tata Teleservices mopped up $200 million for import of capital goods through ECBs. Infrastructure Development Finance Co raised $100 million for onward or sublending. Corporates, registered under the Companies Act, 1956, were earlier allowed to access ECBs up to $500 million in a financial year under the automatic route. However, in September, the government raised the limit of external borrowings with tenure of 5 years or more under the automatic route to $750 million. For the services sector, the ECB limit under the automatic route was doubled to $200 million and for NGOs from $5 million to $10 million. ECBs, which are not covered by the automatic route, is considered under the approval route on a case-by-case basis by the Reserve Bank. ECBs are used as an additional source of funding by Indian corporates to augment resources available domestically. FCCBs are also governed by norms similar to external commercial borrowings. Infrastructure Development Finance Co (IDFC) said Wednesday it would raise Rs 4,400 crore through the issuance of a second tranche of tax-saving long term infrastructure bonds on Jan 11. The issue will be open for subscription till Feb 25, it added. Daimler India Commercial Vehicles, while unveiling the new range of trucks, said that they would be available in the country from third quarter of this calender year, and also plans to start exporting them by year-end. The firm, which is a 100 per cent subsidiary of Germany's Daimler AG, is also considering manufacturing buses in India. "The full range of the new BharatBenz trucks will be unveiled in March and production (at the plant near Chennai) starts in April. The market launch will be in the third quarter of the current year," Daimler India Commercial Vehicles MD & CEO Marc Llistosella told reporters. In February 2011, the company had unveiled the new BharatBenz brand specially designed for India. The firm has set up a 400-acre production plant at Oragadam near Chennai and is investing Rs 4,400 crore in manufacturing, R&D, marketing/sales and setting up a dealership network. Breaking away from Honda has not put the brakes on the the BM Munjal-led Hero Group as its Hero MotoCorp unveiled three new models that will hit the Indian market over the next few months. The company which has already launched the first Hero branded bike in the market last year unveiled two new bikes — the 100cc bike Passion XPro and a 125cc bike Ignitor along with a 110 cc scooter, the Maestro. However, the company has not announced the price of the three models and will be announced at the time market launch. In August last year, India's largest two-wheeler maker Hero MotoCorp (formerly Hero Honda) had ended its 27 years long relationship with Honda. Commenting on the new models, Hero MotoCorp senior vice president (marketing & sales) Anil Dua said the Maestro would be targeted at male customers in the age group of 18 to 24 while the Ignitor and XPro will be looking at executives and college going students. 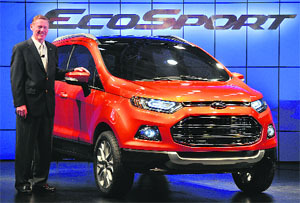 The EcoSport is the second of eight new global models that Ford plans to launch in India, the company said in a statement, as it targets Asian and African markets in a push to increase annual global sales to 8 million vehicles by 2015. Ford, which sold just under 100,000 cars in India in 2011, a rise of 15% from the previous year, has said it expected Asian sales volumes to double to account for a third of the carmaker's global sales by 2020. Ford will invest $142 million in its 200,000 vehicles-a-year plant in Chennai, where the global auto major builds its Figo and Fiesta models, to buy equipment required to manufacture the EcoSport, according to Ford India managing director Michael Boneham. German carmaker Volkswagen said it will invest a minimum of Rs 2,000 crore on its Indian operations by 2013 to ramp up capacity, launch new models and strengthen research activities. The group is also considering to launch its small car Up in India by the end of 2013 or early 2014, Volkswagen Group chief representative India John Chacko told PTI. While e-mailed queries sent to Kingfisher in this regard remained unanswered, industry sources said the debt-ridden carrier could also abstain from any major hiring activities at least till August 2012. Sources said the carrier is looking at about 2,000 job reductions by July and the exercise could affect various positions at mid-manager level in its corporate offices and also at cabin crew and attendant levels, among others. At the same time, the airline, a part of Vijay Mallya-led UB group, could also consider increasing the working hours of staff being retained. It would pay higher incentives and allowances to the staff working longer hours, but the move could still help it cut employee expenses drastically as costs could be double for hiring fresh employees, sources said. It fired Carol Bartz after losing patience with her attempts to turn around the company during her two-and- a-half years on the job. Tim Morse, Yahoo's chief financial officer, has been interim CEO since Bartz's ouster. Thompson has served as president of PayPal, eBay's online payment service, since January 2008. He previously served as PayPal's senior VP and chief technology officer. Sunnyvale, Calif.-based Yahoo said Thompson's new job starts on Jan 9. Morse will return to his CFO post. "The buyback proposal came up for discussion but decision on the proposal has been deferred," sources said. The department, which has identified about two dozen cash rich public sector enterprises with a total balance of nearly Rs 2 lakh crore, had sought opinion of respective ministries on disinvestment through the buyback mode.